Seattle RnR is only 13 days away! It's getting so close. This was my first taper week after my 20 miler last Saturday. I had two great runs, but I took extra time to rest so the weekly recap looks pretty lazy. It was so hard not to run for three days in a row, but I managed. Now that the longest runs are over, I'm being cautious with the right foot that was sore after the 10K on May 27. 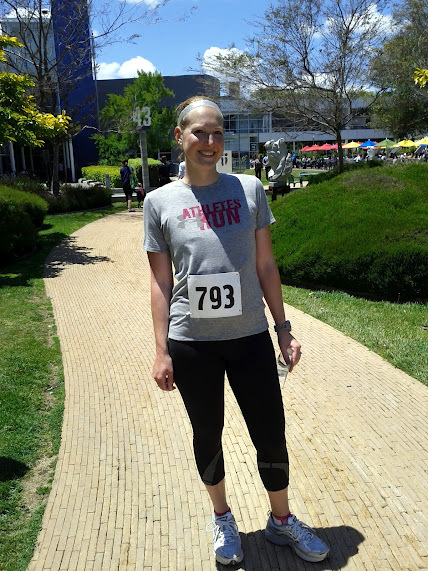 We had a 10K Fun Run at work, with race bibs and all. The fitness center staff planned the event and set up the course for us around the corporate campus. I had a lot of fun! I was targeting a 10 minute per mile pace, not as fast as I know I can go for a 10K because I wanted an easy run day. My friend Krystal joined me at the event, as did a number of my Ragnar team buddies and other people I know. I love the running community at work and seeing everyone at the event. I even had quite a few people cheering for me by name at the finish, something that doesn't happen too often! The course was a little longer than 10K, which the staff told us ahead of time. It also depended if you ran the sidewalks or the bike paths along the road, and I did a little of both. The coure looped the same area four times. It was set up so people could run it as a 4 person relay team if they preferred, a good way to get more employees involved that aren't already runners. I love that idea and tons of people came out for the relay event as well as the 10K. My Garmin read 6.46 miles at the end and I finished in 1:03:07, so my average pace was 9:52. That is not far off my target of 10:00, I'll take it! Happy National Running Day! 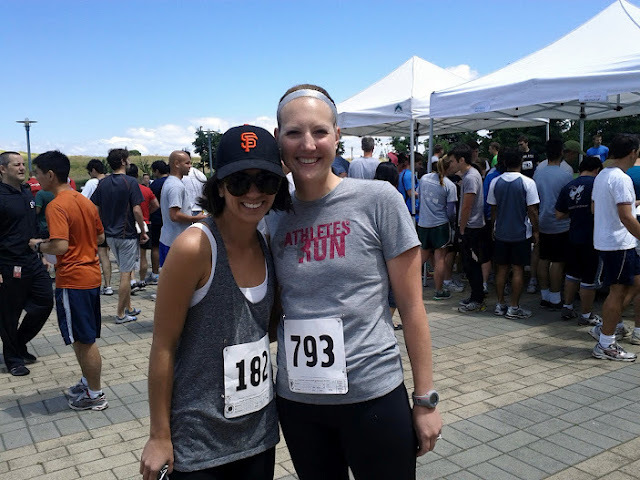 I went to a National Running Day celebration at Running Revolution in Campbell, and we did a group run. I wrote a blog post about how great it was, check it out! The run itself felt good, although most of the group went just over 2 miles. Another girl and I missed the turn off while chatting away and did some extra. I was feeling the calf and foot tightness big time after the Tuesday run and this one, hence the next three days saying rest. I'm not taking any chances going into Seattle. That was my easy workout week. Going into this week, I plan to run 3 days and to do my strength class so it'll be slightly more normal. I'd like to do a mid-distance run next weekend, hopefully about 10 miles. I have another sports massage session this week to work on the tightness, and I'm keeping my fingers crossed it continues to improve like it has so far. The countdown to Seattle is ON! Nice run! Enjoy taper! Wait, I think I already told you that. Enjoy the taper, Paulette......you're going to have a great marathon! Can't wait to read all about it!!!! That's so awesome your work did a Fun Run:) We used to have 5K's at our other office and they were so popular! P.S. Super cute shirt!